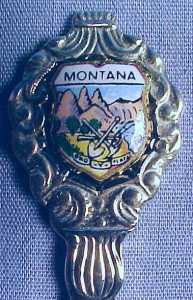 Vintage enamel collectible souvenir spoon of MONTANA by Klepa Arts, Germany, features a colorful enamel shield with a depiction of the mountains, antique gold digging equipment and oro y plata - the Montana state motto. Like other state mottoes, Montana's Spanish Oro y Plata was conceived as the Montanans were deciding on an official seal for the new Montana Territory. In 1865, shortly after Montana had gained territorial status, a committee, chaired by Mr. Francis R. Thompson, got together to determine an appropriate design for the new seal. The committee agreed that the seal should incorporate certain essential elements of Montana's economy and its future. 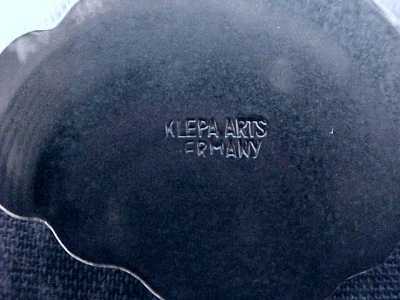 This vintage enamel collectible souvenir spoon from Montana measures 4.5" in length, weighs .4 ounces and is marked on the back of the spoon with KLEPA ARTS, GERMANY.